The most apparently benign days are sometimes the ones with the biggest hidden dangers. After the excitement of yesterday’s finish at Mûr-de-Bretagne, today’s flat stage should have been one for the peloton to catch its collective breath, an opportunity to play a well-scripted game of break-chase-catch before the inevitable bunch sprint. Instead, a combination of crosswinds and narrow roads resulted in a sequence of crashes which left the riders on edge heading into a tricky and slightly uphill finish. In a final which fractured on a short, sharp ramp inside the last kilometre, Mark Cavendish timed his sprint to perfection, catapulting himself from 11th to first in the final 300 metres with an astonishing burst to take his first win of this year’s Tour, and his 16th overall. A four-man break established itself after 4km. Frenchmen Sébastien Turgot (Europcar), Tristan Valentin (Cofidis) and Anthony Delaplace (Saur-Sojasun) – the youngest rider in the race – were joined by Movistar’s José Gutiérrez, who was also in the day-long break on stage three. Their advantage reached nearly six minutes until Garmin-Cervélo moved to the front of the pack to reel them back in. Two crashes occurred before the day’s intermediate sprint after 70km, catching out several riders including Bradley Wiggins, Sylvain Chavanel, Levi Leipheimer and – for the second time in three days – Cofidis’s Samuel Dumoulin. After Turgot had claimed maximum points at the intermediate, the sprinters in the peloton battled it out full-tilt for fifth. Vacansoleil’s Borut Božič took the place, but not before a disgusted Cavendish was forced to check as both José Joaquín Rojas and Tom Boonen moved across and denied him a clear run. After the excitement of the sprint – and as the peloton slowed, bunched up and mentally switched off – two further crashes occurred in the next couple of kilometres. First RadioShack’s Janez Brajkovič fell in an accident also involving Rabobank leader Robert Gesink. Gesink remounted nursing his wrist, but Brajkovič was taken to hospital with concussion and a suspected broken collarbone, his race over. Almost immediately after, Alberto Contador also went down, necessitating a bike change, and later had another spill after a mechanical problem with his replacement machine. The drama wasn’t over yet, though. Contador’s teammate Nicki Sørensen was hurled into a ditch after being clipped by a camera motorbike as he tried to squeeze past on the narrow road. The moto pilot was instantly dismissed over race radio. Then Boonen suffered deep cuts and abrasions after yet another crash involving several riders towards the back of the bunch. In the middle of all this, Europcar’s Christophe Kern also climbed off his bike and handed in his dossard, having suffered with tendinitis in his knee for several days. Despite the delays caused by the various crashes – or perhaps because of the resultant nervousness – the break was caught surprisingly early, with 45km still to go. Consequently it was almost inevitable that another attack would occur, and sure enough Jérémy Roy and everyone’s favourite puncheur Thomas Voeckler duly obliged with 32km left. The pair managed to pull out just over a minute, and the peloton suffered further casualties in the chase as Euskaltel-Euskadi’s Iván Velasco ended up in a barrier. The sprinters’ teams, however, would not be denied. With the peloton closing in to deliver the coup de grâce as the leaders approached the 3km marker Voeckler kicked again, refusing to sit up and concede. But with HTC-Highroad and Lampre not hesitating to share the workload, the former French champion was caught at 1.7km to set up a tricky, slightly uphill finish. Under the flamme rouge HTC’s Tony Martin accelerated at the front of the pace line as the road tipped upwards, but teammate Matt Goss let go of his wheel and all of a sudden the front of the peloton disintegrated. Sky’s Edvald Boasson Hagen kicked hard with 700m to go and was followed by Romain Feillu, but the slight incline was enough to sap their legs as the pack wound up behind them. The yellow jersey of Hushovd hit the front with 250m, but was quickly swamped as Philippe Gilbert and Rojas accelerated past him. Then from seemingly out of nowhere Cavendish – who with 300m remaining was about ten bike lengths behind in 11th – charged through like an express train, easing past first Rojas and then Gilbert to win comfortably by three-quarters of a length. Today was very sketchy. I’m sure it looked great on TV but it was bloody dangerous. It is really crazy when it is that windy on narrow roads. Everybody wants to be in front so as not to be behind the splits if there is a crosswind. It’s not possible if too many guys want to be in the front, so then crashes happen. T0m Boonen would certainly testify to that. The Quick Step leader limped home, in obvious pain and with gritted teeth, over 13 minutes down but crucially within the time limit. His team stated that he will start tomorrow. To add insult to injury, both he and Rojas subsequently had their intermediate sprint points taken away from them by the commissaires, who continue to clamp down on ‘irregular sprinting’. While the desire to avoid a peloton-decimating crash in mid-stage is understandable – and Boonen and Rojas’s offence was more obvious than the one which saw Cavendish and Hushovd similarly declassified two days ago – the constant disqualifications and post-stage alteration of results cannot be a good thing, being too similar to some of Formula 1’s not-so-occasional silliness. It was on the scale of my 2009 stage win [in Aubenas] really, but it was more difficult, because it was unexpected. The stage was hard, the finish was really hard, the uphill. That finish was steep and I went into the red. I was lucky to have my guys, six guys to keep me out of the wind all day. I had Gossy and Tony Martin on that little uphill. At 2km to go, André Greipel turned into my left, there was no way of fending off a big guy. I did drop off. In hindsight that was a good thing it gave me a run up to the finish. I thought I was just going to get some points today to stay up for the green jersey. I was surprised. I’m really happy because it was a difficult one. I knew this was a technical finish and it was a hard stage but the team worked really hard for it today and I think I showed my resilience. The nine guys on the team all did a tremendous job today. Although it didn’t look like a train, in the normal sense when I am at the back, they kept the pace high; they kept it strung out. If they hadn’t done their job, the bunch would have come and I would have been even further back. So they did it to keep it stretched out. Although unorthodox, HTC did a fine job of measuring their effort and keeping the pace high to prevent the bunch from coming back together on the uphill sections on the approach to the finish. 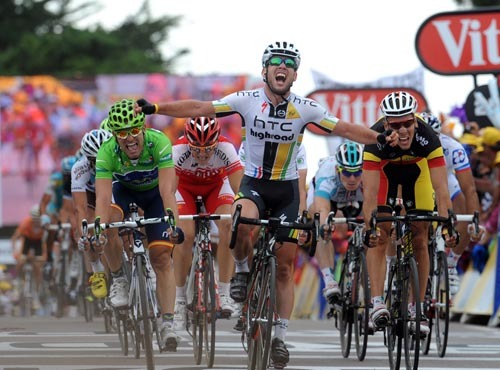 And the final itself put the lie to those who claim that Cavendish is nothing without his HTC train. Unlike on stage three, his team managed the chase and run-in much more cannily than on Monday, still doing a huge amount of work but also sharing the workload with others without losing complete control. It meant that in the chaos of the final kilometre Cavendish was able to pick the right wheels to follow – Geraint Thomas provided a useful but inadvertent lead-out for a critical couple of seconds – and then time his launch to perfection. It was not unlike watching Robbie McEwen at his peak, leaping from wheel to wheel before unleashing a devastating final effort. Cavendish’s 16th Tour stage victory now gives him twice as many as Barry Hoban, the next most successful British rider, and puts him equal with five-time Tour winner Jacques Anquetil. He is also the only British rider ever to win in four consecutive years. (Hoban twice did it three years in a row.) For all that he winds up many of his rivals and a good proportion of fans, he is something quite special, this one. We should treasure him while we can, for a few years down the line we may look back on this period as the prime years of the greatest sprinter the sport has ever known. Chapeau, Cav. Stage six from Dinan to Lisieux is the longest of this year’s Tour at 226.5km as the race continues east along the north of France, passing from Brittany into Normandy. A rolling stage with three minor categorised climbs, the run-in to the finish features a sharp ascent in the final 3km before a flat final kilometre. Some of the stronger sprinters may be able to survive at the front up the climb – expect Hushovd to be right up there defending his yellow jersey – but the finish is more likely to favour a puncheur such as Gilbert, Voeckler or even Fabian Cancellara. As on the Mûr-de-Bretagne on Tuesday, however, do not be surprised if we see another late attack by Contador, which will ensure all the major contenders will be jockeying for space near the front on the run-in to the finish.